Whenever vacation plans turn to outdoor adventure, southern Utah is always near the top of my list. The dramatic scenery of places like Capitol Reef and Bryce Canyon has captivated millions, and I'm no exception! And though those places seem exotic and far away, you can actually get to Zion National Park quicker than Monterey Bay Aquarium. Hiking in the Southwest, I often feel right at home, because so many of the native plants that I see there are species I grow right here in my own yard. Perhaps not surprising, given the climate similarities, but many of these are not California natives and are not widely available in nurseries here. most characteristic of much of the Southwest are junipers (several species), the single-leaf pinyon (Pinus monophylla, the world's only single-needle pine) and the Gambel oak, Quercus gambelii. 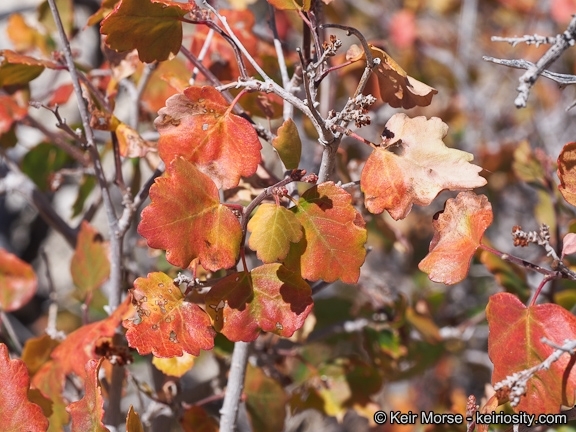 While the first two are known and loved by Owens Valley residents, oaks are not common in our area. I have tried several species in my own yard, but the only one that has thrived is—you guessed it—Gambel oak. 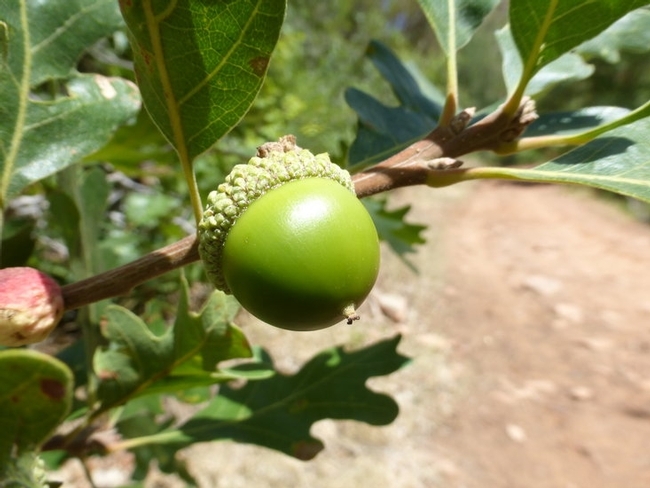 Native to mid-elevations of the Southwest (an alternate common name is Rocky Mountain oak), the Gambel oak doesn't reach the majestic stature of some of our Golden State oaks—the blue and black oaks of the northern two-thirds of the state, or even the coast live oak common along most of our coastline. 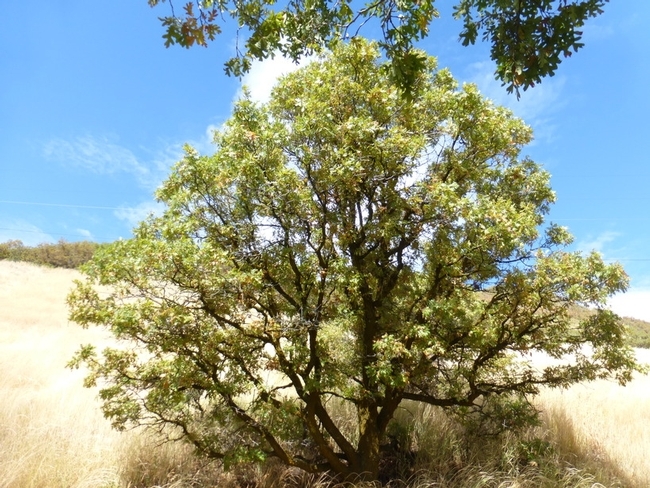 Instead, the Gambel oak ranges from a large shrub to a small tree, growing slowly to 10-30 feet. Though small in stature, the Gambel has surprisingly large, very attractive leaves, 3-7 inches long, with 7-9 lobes. The leaves put on a great autumn show, turning yellow, orange and even red. The acorns have a somewhat whimsical look to me—smaller, rounder and more covered by their caps than the typical oak. They will thrive in nearly any soil. With my soil at the edge of the tablelands in west Chalfant, they'll probably stay on the small side, but in west Bishop's alluvial soils, I'm sure they would reach the top of their size range. Big Trees Nursery in Chalfant regularly stocks these trees, and I urge you to plant Gambel oak for a carefree smaller tree that looks right at home in the Eastern Sierra. If you've got room for companions for your Gambel oak, you could consider one or more members of the Rhus genus. The sumacs have several representatives that are native to the Southwest. I have written previously in this blog about one of my personal favorites, Rhus ovata. The sugarbush is evergreen, 4-10 feet in height, and covered most of the growing season with very distinctive small red fruits. While this species isn't typical of southern Utah, it is very common around Sedona, Arizona (as well as the interior coast ranges of Southern California). More typically in southern Utah, you will find two deciduous species, Rhus trilobata and Rhus aromatica. The former has been dubbed skunkbush for the odor of the cut plant, which I think is very unfortunate. Yes, it's not my favorite smell, but it's not that bad, and how often are you really going to cut the bush? R. trilobata is very useful as a totally carefree small bush that will rapidly grow to six feet tall and wide. The quail and other birds love it for its berries and the abundant cover it provides. With its red berries and divided leaves, it looks a bit like one of our local Ribes species. As a bonus, it has tremendous fall color. This is another one you can find locally at Big Trees or online from High Country Gardens. Rhus aromatica, by contrast, has the common name of fragrant sumac because of its citrus fragrance. 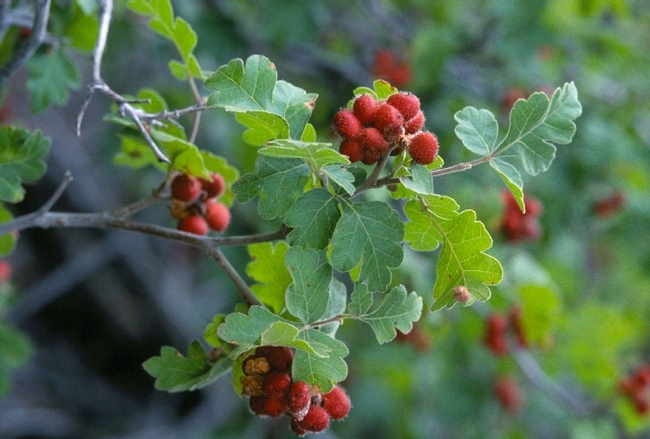 Though not found in California, it is common throughout the US, and while xerophytic like most of the genus, in southern Utah fragrant sumac seems to favor moister (mesic) sites than R trilobata. The native plant grows rapidly to five feet, but the most commonly available cultivar, ‘Gro Low,' reaches only two feet, but spreads rapidly to 6-8 feet wide, providing a tough, attractive ground cover with magnificent fall color. I bought mine from Bishop Nursery, but you can also find it online from High Country Gardens. Mahonias: Useful shrubs for a shady spot. Mahonias belong to a genus of shrubs which are closely related to barberries (Berberis). They originate from many different areas of the world, including the Pacific Northwest and the Southwestern deserts of the United States, while many with the most striking forms come from China and Japan. They are mainly characterized by evergreen, spiny pinnate leaves which are leathery in texture and sometimes glossy so that they resemble holly. 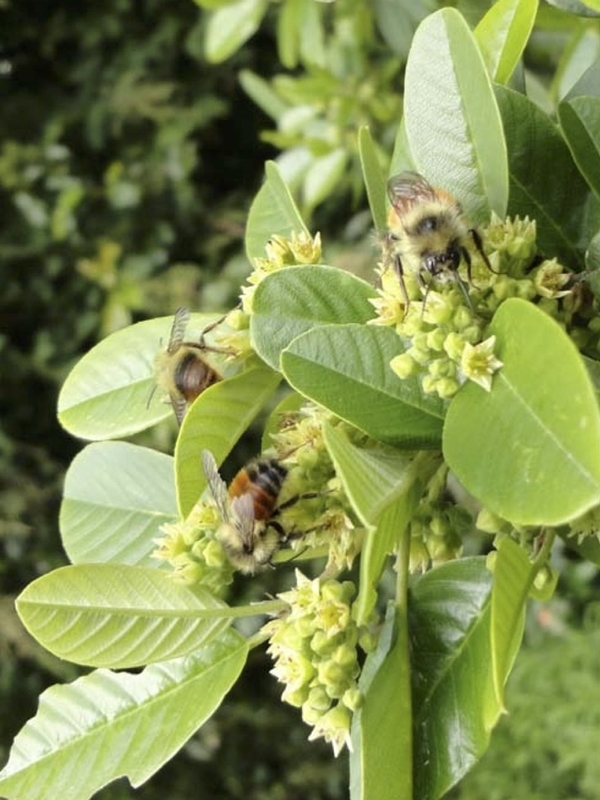 They are valued for their yellow flowers which are produced in either rounded clusters or elongated spikes in late winter and early spring when little else is blooming, and these are beloved by honey bees, so provide some welcome early food whenever the sun is warm enough for bees to fly. February flowers of Mahonia X media. 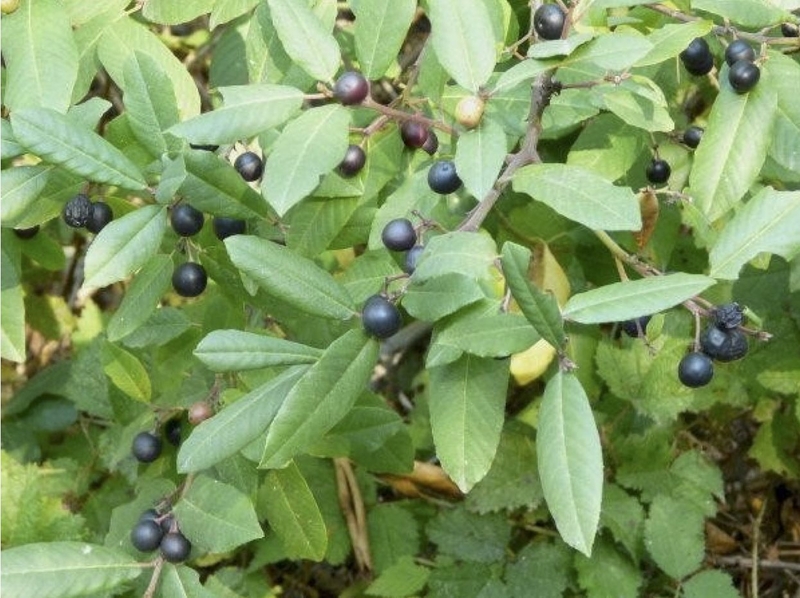 The flowers are followed by berry-like fruits, either blue or black in color, and often covered in a powdery bloom. These are considered edible, although they are somewhat bitter and should not be eaten in large quantities since that can cause a drop in blood pressure, vomiting and a lowered heart rate. They are also said to make a flavorful jelly, although I have never tried this personally. In the garden they can cope with a variety of different exposures depending on the species, but most prefer shade, or shelter from hot afternoon sun in desert areas. Many will even grow against a north facing wall. Heights also vary by species, some being creeping while others can grow to 12 ft., although that height would only be reached under optimum conditions. Water requirements also vary and I have found that although many originally come from the Pacific Northwest they are surprisingly tolerant of dry shade. 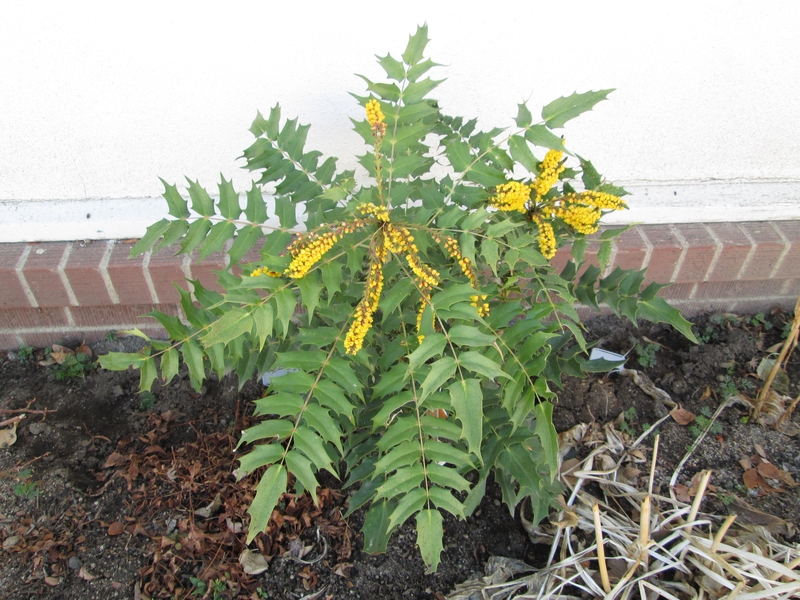 In general the Mahonias are considered easy to grow although they may take a little while to settle in after transplanting. For many years I avoided growing these plants because, although the leaves were quite handsome, the actual plants that I saw in peoples' gardens tended to look rangy but I have since discovered that with occasional, judicious pruning they can be quite handsome, and since they do grow in the high desert, and are generally ignored by deer they have much to recommend them. Last year I planted a variety of Mahonia x media 'Lionel Fortescue' on a north facing wall, and not only did it come through the winter with flying colors, flowering early as promised in mid February, but it also coped with brief blasts of afternoon sun coming from the west without any damage to its leaves. It has a strong upright habit which promises to be a striking focal point in the border. The more commonly planted Mahonia aquifolium, or Oregon Grape is generally lower growing and spreads by underground stems. It may grow to 5ft. high under ideal conditions, but can also be used as a ground cover if tall stems are removed at the base. Often new growth is reddish in color. 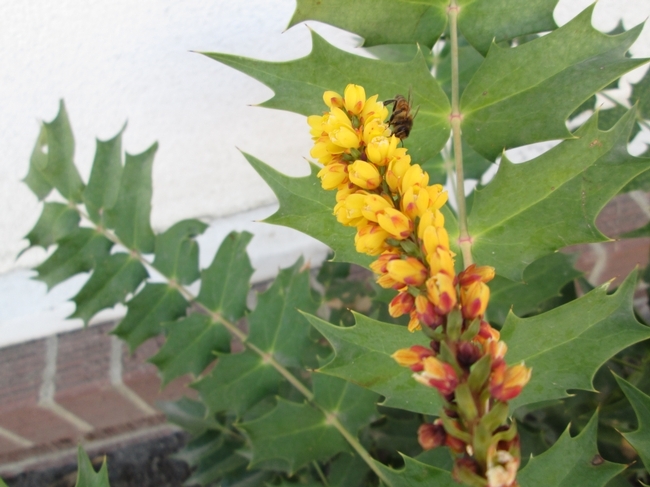 The desert native, Mahonia fremontii is an upright, multi-stemmed shrub with very spiny gray-green leaves and short spikes of yellow flowers in late spring. It is generally considered hardy in USDA Zone 7, although it comes from the Southwestern desert. It requires very little water. Another popular hybrid is Mahonia "Skylark" which grows to 5ft tall, has reddish new leaves which then take on a purple hue in winter. The berries are dark purple. It requires little water. There are many other varieties of Mahonia, so whether you are looking for a low-growing foundation shrub for an informal woodland setting, or a bold focal point, a scan of specialist nurseries should provide you with a plant to fit your needs. When I moved to the wilds of West Chalfant a dozen years ago, I knew that native plants was the only way to go. Because there wasn't much available in local nurseries back then, I turned to the Internet and ordered a big box of plants online from Las Pilitas Nursery. Some have lived and some have died, but the true gem of that box has been a plant I previously did not know—Rhus ovata, commonly called sugarbush. As far as an all-around performer, it may be my very favorite bush. While most members of the Rhus genus are (in my opinion) somewhat homely, sugarbush is refined and handsome year round. The foliage alone makes it worth planting. The large, glossy, ovate leaves are attached via maroon petioles. The leaves are arranged alternately along the maroon-tinged stems, and I like the fact that they are well-spaced along those stems, giving the bush an open, but not sparse, look. 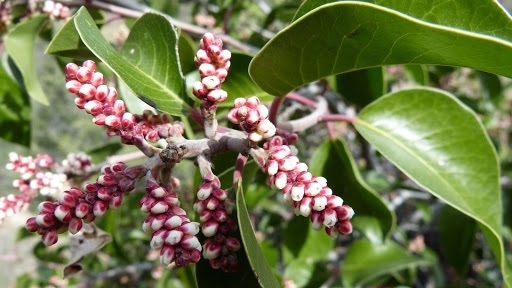 The small, white flowers are borne in tight clusters in the spring, and the tips of the branches are covered with attractive maroon sepals for much of the year. Though I have never tried it, the small red berries can be used to make a lemonade-type drink. Rhus ovata is native to chaparral below 4,000 feet, from southern California east to south central Arizona. Though evergreen in its native range, our colder winters can make sugar bush lose its leaves at the very end of the winter. Location can be key. The first few winters were pretty tough on my bushes, and I contemplated removing them. Instead, I cut them back to the ground and relocated them to areas next to the house. What a difference! They have thrived on the south and west sides of our house and generally retain their leaves throughout the year (though the leaves can brown along the margins around February). As though its good looks weren't reason enough to grow it, sugarbush is incredibly low maintenance. Mine are now close to the house, so they get regular water, but they would do fine without it. On the Las Pilitas website, they say they haven't watered their mother plant in over 20 years! You can prune it however you like or even cut it back to the ground—it will only come back stronger, and unlike the deciduous Rhus species, sugar bush doesn't sucker profusely. The literature suggests wearing gloves when pruning, since, like other sumacs, the sap can cause a rash, but this is not something that has been a problem for me. Rhus ovata is a plant that deserves a place in your yard. It grows up to 10' tall and wide, so about the same as those boring Photinias that are everywhere. Sugarbush won't grow quite as fast, but it will give you (and wildlife) carefree, year-round pleasure. The problem, of course, is that I've never seen this plant locally, but look for it on your next trip to Southern California. Here are some native plant nurseries that carry Rhus ovata and a lot of other great plants. Links provided for your convenience. No endorsement intended or implied. Years ago, when Steve and Debbie Blair were just starting to sell trees from their home in Chalfant, I became a regular customer and Steve, knowing I was an active gardener, asked me for a “Harold's Top Ten” for our area. When I dropped by his Chalfant Big Trees Nursery the other day, Steve saw me looking at a borage plant and told me that it was on the list. While I do remember growing it when we first moved out to Chalfant (and if you've grown borage before, you'll know what I mean when I say that it did, perhaps, too well! ), it's not something I've grown for years. Steve said he's still got the list, and it would be interesting to see how my choices have changed since those early days of planting in the wilds of West Chalfant. One plant I'm confident has been on the top ten from the beginning is California coffeeberry. Coffeeberry is a member of the Rhamnaceae, or Buckthorn family. I've always known it as Rhamnus californica, but recently it has been reclassified as Frangula californica. 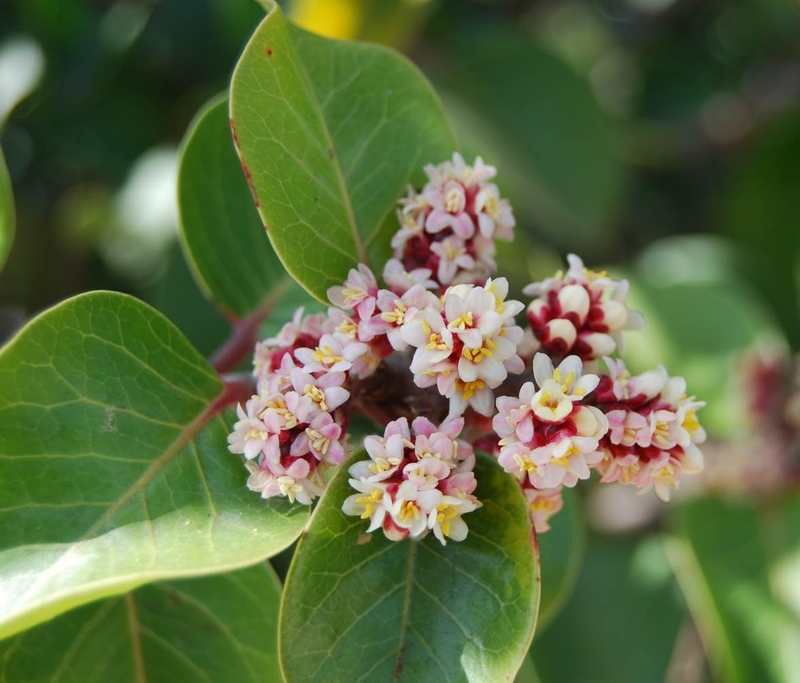 Many of you are probably familiar with coffeeberry, as it is one of the most widespread plants of the California landscape. I normally associate it with the chaparral and oak woodlands, but one or more of its subspecies can be found in nearly every community throughout the state. You can see an interesting map of its distribution here or go to the CalFlora website. Locally, I have encountered coffeeberry only occasionally, most notably in the south fork of Big Pine Creek. Then just yesterday, I saw some tremendous specimens up a little side canyon near the creek crossing on Baker Creek Road. When I found coffeeberry at a nursery years ago, I knew it only from the Santa Cruz mountains, and I wasn't even aware it occurred on the eastside, so I considered it 50-50 that it would make it through the winter. Though the leaves do look a bit stressed by the end of the winter, it always comes roaring back in the spring. I made my first planting close to the house, thinking it would benefit from the extra protection, but I have planted several more over the past dozen years, and all have thrived (“thrived” being a relative term here in the far western reaches of Chalfant!). The other foundations of my landscape as far as evergreen broadleaved shrubs are mountain mahogany, bitterbrush and sugar bush. While I don't trust coffeeberry to be as cold tolerant as the first two, which are more common local natives, it is hardier than the last, Rhus ovata, a native of the SoCal coast ranges (but which I first noticed in Sedona) that is definitely another of my top ten shrubs. Coffeeberry is like some of the best kind of people: not particularly flashy, but always handsome, dependable and low maintenance. We appreciate the green it provides throughout the year. All manner of flies and bees appreciate the tiny white flowers (I hear a quiet roar each time I pass the ones by my back steps), and the berries all seem to disappear, so I assume the birds are enjoying them surreptitiously! Depending on the authority you consult, there are between two and six subspecies and several named cultivars. I have one I purchased as a tiny baby from the Bristlecone Native Plant sale (ssp. californica?) maybe eight years ago that is now six feet tall. From Theodore Payne Nursery near San Fernando, I purchased Frangula californica tomentella, which has done less well, but it is in a very challenging location and still looks pretty good. My others are all the widely available ‘Eve Case' cultivar. The descriptions online say that ‘Eve Case' is somewhat smaller than the species, but that has not been the case for me. In my yard, the natives seem to have smaller, less glossy leaves. I have some plants that get water daily during the growing season and others that get a soaking every week or two. All have done well. You can just leave them alone and they look great, but they take kindly to any amount of pruning. I have even cut them back to the ground, and they crown sprout beautifully. In my yard they seem to reach a height and width of about eight feet, but, as I said, they are very amenable to whatever size you want to make them! This is not the easiest plant to find, but a few individuals do show up each summer in our local nurseries, and they are widely available in native plant nurseries throughout the state. So bypass those boring shrubs at the big box stores, go your local nursery and ask them nicely to order a few coffeeberry plants for you (one gallon is fine if you can get it). You will not be disappointed, and the birds and the bees will definitely thank you. Manzanita, A Favorite Native Plant. I've always loved the look of manzanita and in California there are lots of different species. 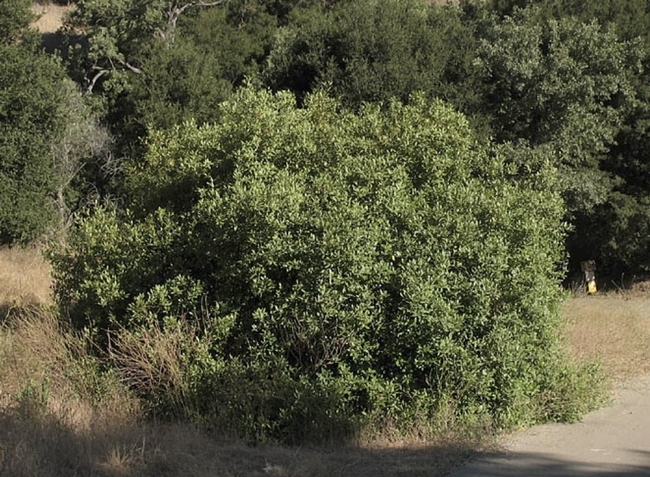 Manzanita is a native shrub in California, occurring in a lot of different elevations. They range from coastal to mountain species. According to the California Native Plant Society website we have two species commonly occurring in our area of the Eastern Sierras, greenleaf manzanita, Arctostaphylos patula and pinemat manzanita, A. nevadensis. Of these two, greenleaf manzanita is the larger shrub and pinemat manzanita is the very low shrub often found at high elevations. It's important to remember that collecting plants on public lands always requires approval and a permit. To purchase plants, check with your local nursery, many nurseries are carrying more native plants for sale. Also visit the local California Native Plant Society plant sales. Manzanita is a slow growing plant, often available from specialty native plant nurseries. 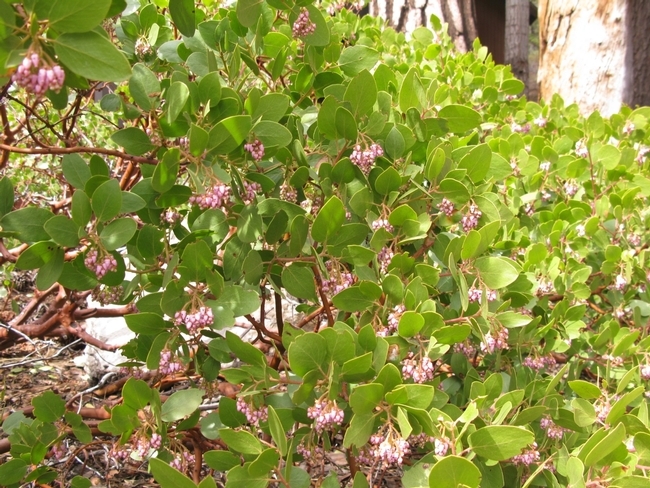 If you have a friend or neighbor with manzanita, some species can be propagated by a technique called layering. Layering is done by “pinning” down a tender branch into the soil with a U-shaped piece of wire. It is left to root for a growing season. At the point where the branch touches the soil, wound the bark with a sharp, clean knife and give it some supplemental water. After roots have grown at the wound site, the rooted branch can be severed from the older plant, given time to recover and transplanted in the fall or next season. Greenleaf manzanita is shown to occur in our area into West Bishop, and ranging into higher elevations. 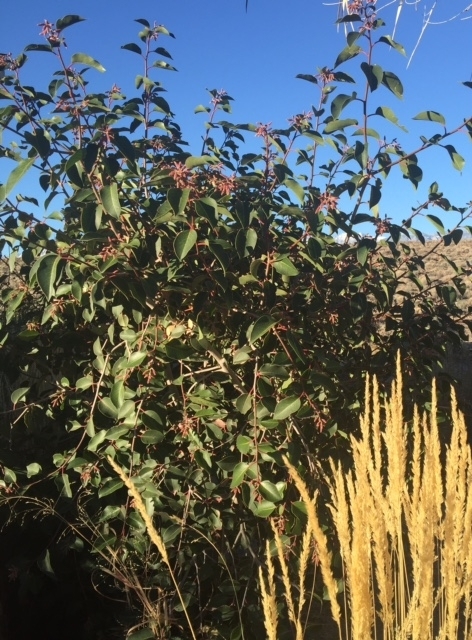 In my high elevation yard I have a couple of manzanita plants, which I believe to be greenleaf manzanita. The larger bush predates my house of 30 years by I don't how long. It is about ten feet across and four feet high. It has been there thriving without any help from me for its entire life, nor does it seem to need any help. I have thinned the branches to reduce fire fuel loads but not too much as the bark can sun scald and crack without its protective leaf canopy. These thinned out branches are never thrown away by me, instead I know several people who love to use them as decorations, the smooth red bark and twisting branches look good for years and I still see them in homes they went to 25 years ago. Besides beautiful deep red bark, manzanitas have evergreen leaves, which in my yard pop out of the snow each year as winter slow, looking unconcerned by the heavy load they may have received. In spring lovely white to pink flowers bloom, shaped like upside down urns. The flowers are small but form clusters of pink and white against the dense foliage. The shrub is a nursery and shelter to wildlife. I've seen generations of blackbirds and robins fledge from nests within its' branches. Last year I watched as four young Steller's Jays waited in the center of the manzanita for mom or dad to bring tasty treats. The flowers attract butterflies and other flying insects. A variety of bee, I suspect, is the one making little holes at the base of many flowers to get at the nectar but I also photographed a butterfly using the same access to the flower. This spring on warm days I've had clouds of butterflies and moths feeding at the manzanitas. So far this year most have been Painted Lady Butterflies and a few Red Admirals visiting the flowers. The moths, or maybe they are skippers, are too fast for me to see who they are but if I stand still the butterflies feed close by. Occasionally they land on me but in inconvenient spots for a close up photograph, the back of my shoulder seems a good spot to a butterfly, or maybe a rest on the toe of my shoe. I have never seen an insect pest problem on my manzanitas, although they do host some caterpillars. I have had aphid problems on several plants, but have not had a problem on mymManzanitas. If they do get insect pests, the damage appears to be minimal. And for the larger garden munchers who frequent my yard, I have seen ground squirrels take the tips of the bush to not much detriment, but have never seen deer munch on it, and they generally try everything in my yard. At the end of the summer, the flowers have produced little fruits that look like miniature apples. It's this aspect that inspired the Common name of manzanita, in Spanish it means little apple. The fruits are favorites of many birds and mammals, even the bears feed on them. And in looking up the species name of Arctostaphylos I have found it is from the Greek words of arctos for Bear and staphyle for grapes. If I needed further proof of the inspiration for this name, I only need reminding from my neighbor who had often seen a mama bear and two cubs last year, foraging on the small fruits on my manzanita plants. With all the use the plants get from my wild neighbors, it always looks good without any effort on my part, which is another reason it is one of my favorite garden plants. California Native Plant Society www.cnps.org Photos, searchable database & commercial sources listed. Climate Zone: Varies by Species. Check CNPS site, searchable database by address. Plant Structure: Shrub, some low ground covers. A few are large tree like shrubs. Water Requirements: Low. Some water needed while plants are young. Fire Potential: High. Do not plant next to structures. Low ground covers have less potential for ladder fire fuel.